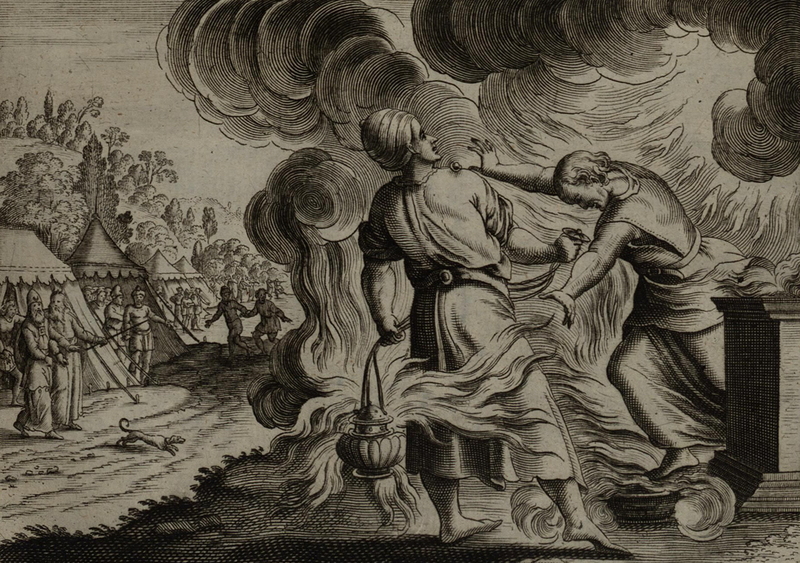 This is an artist’s rendition of the sons of Aaron, Nadab and Abihu, offering strange or unauthorized fire before the Lord. This entry was posted in Aberrant Theology and tagged Aberrant Theology, Bethel Redding, Introductory Material. Bookmark the permalink. Good work Tony, will be praying for you as you embark on this journey. Teach the truth (the Word of God) and it will not return void! Nice job with the links throughout your blog! Looks like a great resource! May God use this blog for His glory. May people trapped in ‘Bethel’ see the Light and come out of this cult. Keep going and keep providing truth. Why are people calling this a cult? “Grave sucking” has absolutely no biblical basis. This is heresy in its purest form. So sad to see coming from Bethel. Bethel Church (Redding, Ca., Bill Johnson) is involved with Demonic Activities, promoting communication with the dead, which is strictly forbidden in God’s Word. They also endorse Demonic ministers like Todd Bentley and John Crowder. Also, they allowed two young ladies to blaspheme God by acting as if they were toking (smoking dope) the cross, and getting high on God. Tony: bethcavete.wordpress.com has same great post exposing Bethel and Bill Johson; not sure why she has been silent and a lot of comments removed unless threatened or coerced. Someone had posted to research these corrupt ministries is Google: ” abused by name of church (Bethel) and or pastor (Johnson etc). People’s negative feedback on Bethel and or Johnson and controversial articles on Bethel/Bill Johnson”; that goes for any church, pastor etc., and read the abuses and dogma and lies. Each Site will refer you to more and more reads. Austin Miles wrote a Book called “Don’t Call Me Brother”-1989 exposing charismatic corruption and no one heeded. 2nd Book-1990 was people’s letters in response to 1st book. What about Pagan Christianity (green cover) By Frank Viola. One Author would call this current movement schizophrenic without looking at the Biblical Types of Old Testament. How come Bethel, and IHOPrayer KC/Bickle and many like aren’t shut down and have their church mafia to throw people out?